Science, technology and economic growth motivate our society. Each is carried on with little regard for Christian concerns.Brian Walsh and Richard Middleton yearn for change. They long to see Christianity penetrate the structures of society, reforming and remolding our culture. 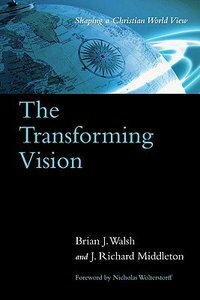 From scholarship in the universities to politics, business and family life, the Christian vision can transform our world.To stimulate such change the authors analyze our troubled age, show us how it got that way and suggest a solution. Their clear presentation of a Christian world view forms the basis of their hope. Brian J. Walsh (PhD., McGill University, Montreal) serves as the Christian Reformed Church chaplain to the University of Toronto. With Richard J. Middleton, he wrote The Transforming Vision and Truth Is Stranger Than It Used to Be (both IVP). He is also the author of Langdon Gilkey (University Press of America, 1992) and Subversive Christianity (Alta Vista College Press, 1994) and Colossians Remixed: Subverting the Empire (with his wife Sylvia Keesmaat)-Editorial Review. J. Richard Middleton (Ph.D. from the Free University of Amsterdam) is associate professor of biblical studies at Roberts Wesleyan College and associate professor of Bible and culture at Northeastern Seminary, both in Rochester, New York. Middleton is the coauthor of Truth Is Stranger Than It Used to Be and The Transforming Vision, and the author of Liberating Image: The'The Imago Dei' in Genesis 1 and 1 & 2 Samuel (Abingdon Old Testament Commentary).-Editorial Review. part 1: What Are World Views?